Public television fills a unique niche for viewers looking to learn something about their community. Indeed, as Panhandle PBS's mission statement says, in part, public TV intends to "educate, inform, enlighten and entertain" those who tune in. 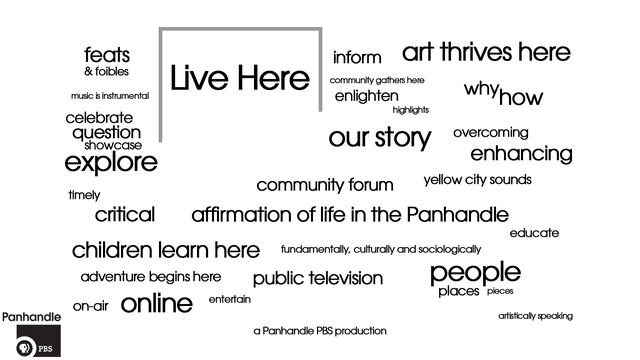 On Feb. 4, Panhandle PBS takes a big step toward cementing its mission in the Texas Panhandle when it debuts "Live Here," a public affairs program that will be produced and broadcast from the Gilvin Broadcast Center on the Amarillo College campus. "It's time to get on our own air," said Panhandle PBS general manager Chris Hays about the impending debut of the new program. "We'll be filling a void by exploring public affairs and getting in depth in some of the issues affecting our community. We believe we are going to provide a public service to our commnity by talking about public affairs." The inaugural segment, which airs at 7 p.m., will explore the impact of the drug court instituted by 181st State District Court Judge John Board. The drug court diverts drug offenders who otherwise might be sentenced to jail or prison and puts them into an intense drug rehabilitation program. The segment features a young woman who sank to the depths of drug abuse through her use of seriously hard-core drugs, including heroin. Her story is heading toward a happy ending. "She's really been transformed," Hays said. The next segment will talk about educational attainment and follows the journey of a young man who also got hooked on drugs. He lost his livelihood, his family and found salvation at Faith City Ministries and, then, by pursuing his education. "Yes, education is a big part of our mission," Hays said. "We intend to explore what's happening and why it's happening." "Live Here" will be broadcast in 12 segments, once each week. Panhandle PBS plans to take some time off during the summer, and then return with 12 more segments. Remember the controversy over the treatment of unwanted pets at the Amarillo animal control shelter? "Live Here" will examine what's happened to the newly renamed department that now is headed by Richard Havens. "Live Here" will accompany a delegation of Panhandle dignitaries traveling to Austin to take part in the Panhandle Days events occurring in the Texas Legislature. "We're looking at doing some Government 101 things," Hays said. "We want to look at what the city is doing and why they're doing it and we want to tell viewers why it's important that they take part and vote" in municipal elections. "We want to get out the vote," Hays said. Jacob Workman, Panhandle PBS's content production coordinator, said he's "excited about shining a light on different organizations working together, pooling resources and making the Panhandle a better place." Workman believes "Live Here" will shine a light on "amazing things that are going on here, things that you don't hear about in sound bites." And so, a new era at Panhandle PBS begins on Feb. 4. Tune in and learn why we "Live Here."